Author’s note: An analogy drawn between the famous trilogy film of internationally acclaimed Indian filmmaker Satyajit Ray and the cycle of life and death–which lies at the heart of Indian philosophy. Since times immemorial, our ancient sages, spiritual thinkers and philosophers of Vedic Hinduism have contemplated upon the inevitable end of life–death. From their contemplation as well as from the numerous ancient scriptures, have evolved perceptions regarding death—not as an end to all, but as a pivotal step towards the existence of the human soul, or in other words, a temporary cessation of physical activity. When talking about the vision of death and dying in our philosophy, on one hand we are reminded of the teachings and the quintessence of the philosophy of Sankara, who had preached: “Brahma Satyam Jagan Mithya Jivo Brahmaiva Na Aparah”: which can be translated as: “Brahman (the Absolute) is alone real; this world is unreal; and the Jiva or the individual soul is another form of the Brahman. On the other hand, there are several lucid articulations of our religious belief in the Atman and the Brahman identified by several other spiritual thinkers. They have emphasized on the intensification and expansion of the religious and moral connotations of life, death and human action—in other words–Dharma, Moksha and rebirth, through the classical Indian spiritual teachings. Years later, the greatest of all poets, the intense spiritual thinker Rabindranath Tagore, who was himself a Brahma by descent, had remarked that death is not an extinguishing of the light. It is rather an act of putting out the lamp to welcome a new dawn. This perception of Tagore the philosopher and the thinker, which perfectly embodies the quintessential celebration of life through the vision of death, has yet again been reflected through the lens of yet another great thinker, visualizer and filmmaker of all times, Satyajit Ray. And the very first film that comes to our mind when discussing the concept of death and how it celebrates the force of life, would undoubtedly be the Apu trilogy comprising “Pather Panchali” (Song of the little road—released in 1955), “Aparajita” (The Unvanquished—released in 1957) and “Apur Sansar” (The World of Apu—released in 1959). Exuding a raw energy and supreme power of art, the entire trilogy, on the surface level, traces the epic journey of the sole protagonist Apu from his impoverished rural boyhood to his years in Baranasi and Calcutta to his marriage and fatherhood. On a more metaphysical plane, the three films depict the unique life of the protagonist in various stages where he is time and again faced with the exploration of the range and depth of spiritual inquiry, centered round the vision of death. In the first film of the trilogy, “Pather Panchali”, which was shot entirely in the rural outskirts of West Bengal, India, Ray’s camera went on to explore universal themes of life, uniquely portraying the unforgettable sweep of life in the protagonist Apu’s life in his idyllic childhood with his sister Durga and their old aunt, Indir Thakrun. Critics have later remarked that through the most truthful, unobtrusive and modern photographic style that Ray used in all the three films of the Trilogy, he has actually tried to embody the essence of the Italian neo-classical cinema he was so much in love with. It was his vision of human life which has time and again been used as a raw material of the kind of cinema he stood for. Based on this singular vision, his camera has followed the daily lives of the protagonists, resulting in a simple universality of the themes of his films, and the effectiveness of their treatment. This is as true in case of his “Apu Trilogy” as it is in his later works. The main theme of “Pather Panchali”, played on a bamboo flute and taken from a song the old women ‘Indir Thakrun’ sings to herself in her long and persistent wait for death, tugs at the heartstrings with the openness and freshness quite unmatched in the history of cinema. The song, “hari din to gelo shondhya holo/paar koro amare”—refers to the crossing of the river at the end of the day by a helpless voyager of death—in a pretty obvious evocation of the crossing over from life to death. In the entire film, little unforgettable images of idyllic childhood and humane sequences—including that ofApu and Durga and the ducks of the village parading after the local candy-man in Felliniesque fashion, Durga supplying her old, frail Aunt with stolen guavas from the neighbor’s orchard that inspire huge toothless smiles to the old woman, the excitement and pristine pleasure of the siblings induced with the sight of a running train amidst the rural railway tracks—together contribute in giving an elemental quality of human life to the film. On the other hand, there is a subtle but clear juxtaposition of birth and death, affection and anguish, pettiness of everyday life and the joy of it that leave indelible images in the mind. What is more unique, the death sequences in the three films of the trilogy are each marked by brilliant innovation, calculated to give them a new intensity of a personal experience in the mind of the protagonist Apu. The juxtaposition of life and death, or the journey of life and it’s end with death as the inevitable revolves around the film with the intrinsically woven sequences. The frantic search for the train by Durga and Apu in the vast, open field of white Kash flowers is one of the most lyrically filmed, evocative scenes in the film, symbolizing the children’s quest for the world beyond their reach. There is the onset of the monsoon bringing hope, joy and new life. Ray’s lenses follow the first rain drops of the season, falling on the bald plate of an angler, on the water hyacinths in the pond, and over the trees in the field. The momentum slowly builds, drawing Durga to her dance in the rain (one beautiful, evocative work of cinematography). Gradually, the storm rises in ferocity, destructively threatening the foundations of their dilapidated house and ultimately claiming Durga’s life. On the other hand, Apu’s Aunt Indir Thakrun’s death scene contains a vital emotional and visual sweep of the film, as the scene shows the child Apu’s first tryst with the concept of death. At the end of the film, when Durga dies, Apu is seen to perform his daily tasks of combing his hair, brushing his teeth alone. Here, Ray’s lenses seem to suggest that he will now be destined to travel his own path. 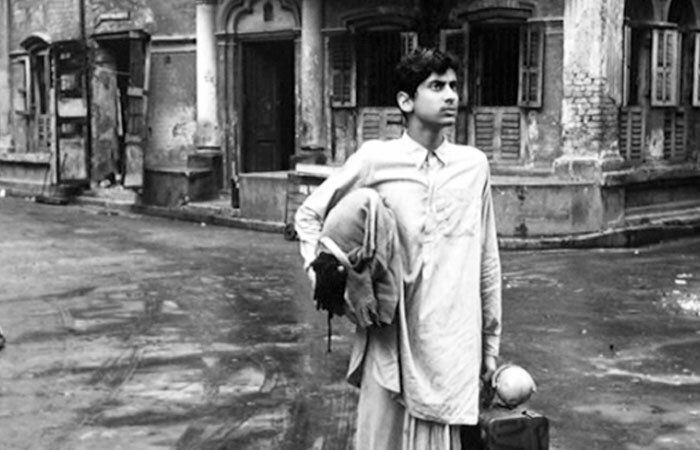 In the following film “Aparajito” (The Unvanquished), when the ten-year old Apu is shown to cope with his father’s sickness and his mother’s over-protectiveness amidst the backdrop of Benaras, the boy is shown to struggle to achieveindependence, demonstrate his academic gifts and ultimately journey towards a decent university life in Calcutta. The most evocative death sequence of this film comes at the moment of Apu’s father Harihar’s death, where Ray’s lenses follow with precision the glimpse in Harihar’s eye as he takes his last swallow of holy water from the Ganges, the pigeons in the roof of the building abruptly fleeing, noisily flapping skyward. As a seventeen-year old Apu, the boy is seen to lead a new life with each death in his family. The mother dies in a sequence that begins with visuals of her son’s sun dial; the scene continues through the fireflies of the evening and ends with Apu’s encounter with the empty house in the village, with the suggestion that the boy will be led to a new life again, with this death. In all the three films, there is a strange recurrence of death which is placed as the opposite side of the coin of life, and Ray presents it with a sheer classic touch that evokes humanistic response. 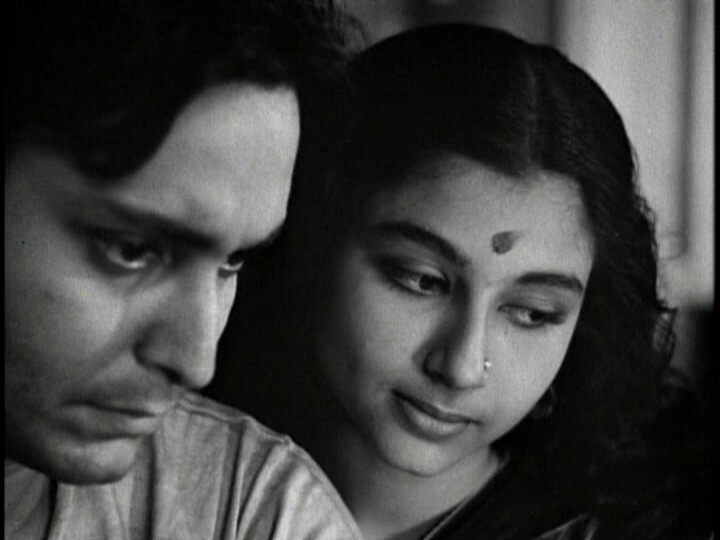 A romantic youth Apu in the last film of the Trilogy, “Apur Sansar” (The World of Apu), who earns a living out of tutoring, spends most of his time vaguely fantasizing about his future, playing his flute, and writing his novel, quite accidentally starts his family life by marrying Aparna. Apu’s detachment from Nature in his adulthood starts with the first reel of the film showing his dingy one-room near the train lines—-the same train, which symbolizes the advent of the outside world for the child Apu. On the surface level, this detachment shows Apu as a lonely recluse. On a metaphysical level, it suggests the onset of a new phase of his life, which begins with his learning to reconcile happiness with the ties of a family. The relationship with Apu’s wife that begins with trepidation and poverty gradually matures to an enduring and adorable one. However, it is the sheer twist of fate that the young bride leaves to be with her family for childbirth and never returns. Her death in childbirth provides the final blow of life to Apu from the thematic level, as he buries all his dreams and disbands his unfinished novel to seek “peace” through routine work in a remote mine. However, in a symbolic level, the recurrence of death brings home the overall theme of the trilogy, that death and rebirth must make their mark in human life. This symbol of death and rebirth recurs throughout the journey of Apu’s life, and culminates when years later, the father Apu is re-united with his five-year old son, Kajol. The last scene of “Apur Sansar” which shows Apu carrying Kajol on his shoulder, very evocatively depicts the fact that after traversing a long and weary road, Apu has found salvation at last. This salvation is the very essence of the concept of “moksha”, which is the very nucleus of the philosophical teachings based on “Vedanta” and “Vedanga”. There is a strange co-existence of life and death as the obvious counterpart of life, working as the nucleus of the Apu trilogy, and the cinematography of Ray is instrumental in depicting this co-existence with its brilliant style of neo-realism. This is true in case of “Pather Panchali” where the child Apu, living on the edge of poverty with his sister and his family, struggle to understand the greater truths of the world–the nature of man and his ability to face the future through two deaths in the family. In “Aparajito”, there is the same poignant lyrical quality of life battered by death, depicted in some scenes with the adolescent Apu and his surroundings. The ‘ghats’ (shores) of Benaras, the village of Mansapota where he moves with his mother after his father’s death, reflect a sublime, deeply affecting struggle between death, life and personal experiences in the mental world of Apu. The celebration of life through the mystic vision of death follows till the culmination of Apu’s journey in “Apur Sansar”, where the world of the ever-ravaged Apu is shown with subtle symbolism. All the while, Ray’s lenses follow the mental world of the child Apu who gains maturity and salvation in the end of the Trilogy, after a weary journey of his vulnerability, despondency, pessimism, escapism and hard-hardheartedness, all of which have been a cumulative result of the deaths and personal losses he had encountered in his journey of life. The choice of the riverside as the location in the final scene of “Apur Sansar”, with Apu carrying his son Kajal on his shoulders, is charged philosophically, conveying the endless ebb and flow of life, which must go on, no matter what. In the realm of our philosophy, where both birth and death are perceived as two distinct illusory scenes in the human journey of this world, it is the self-realization of the human mind regarding the birthless and deathless “Atman”, the Infinite, and freeing oneself from birth and death that is emphasized on, time and again. 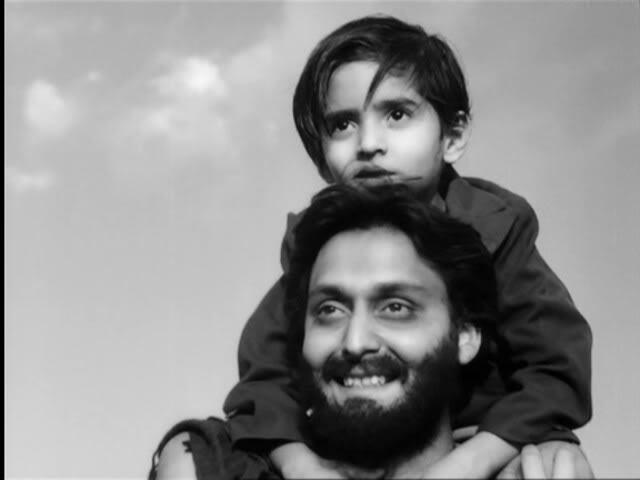 Likewise, throughout the Apu Trilogy, Ray has emphasized on the elemental beauty and the ultimate reality of human life that underlies the death sequences, the scenes of disconsolate grief and excruciating struggles of Apu’s mental world. Thus, through his documentation of the soulful and poignant journey of the life of Apu, the central protagonist, he accomplishes the metaphysical task of depicting life as a cycle of creation, preservation and destruction—which lies at the heart of the six Vedangas and the six systems of Hindu philosophy. A review/essay written about my all-time favorite classic novel ‘Wuthering Heights’ finds a home today at Learningandcreativity.com. So happy to share it with the readers of L&C. A Gothic tale of passion, vengeance and the elemental clash between man and his destiny, Wuthering Heights, the only novel by Emily Bronte published in 1847, remains one of the most acclaimed works of English literature till date. Long after the publication of the novel ‘Jane Eyre’, Charlotte Bronte, another Bronte sister used to receive the utmost critical admiration. In fact, Emily in particular was often presented by critics back then as a ghost-like presence surrounded by the ghostly moorland, cut off by the human society. By the 1880’s, however, critics began to appreciate her stupendous literary craft, the brilliant structure and the meticulous execution of the different themes of Wuthering Heights. Over the years, the novel has been regarded as one of the most powerful works of art due to its depiction of the passion and relationships, the physical and spiritual struggles between a couple of families living in the Yorkshire moors. The narrative of the entire novel revolves around the all-encompassing, powerful and passionate love between Heathcliff and Catherine Earnshaw, and how their thwarted passion eventually disrupts and destroys their lives as well as the lives of those surrounding them. Throughout the narrative, which critics have labeled as strange, powerful and imaginative, there is an elemental clash between the two opposite forces”storm and calm. Both Catherine and Heathcliff, while remaining closely connected to each other in a strange, inexplicable way, represent the elemental force of the storm. This strong, elemental force of the storm that Catherine and Heathcliff symbolize seek not only passionate love, but a stronger, higher spiritual existence that transcends mortality. On the other hand, Thrushcross Grange and the Lintons represent the calm that is time and again invaded and consumed by the elemental storm of Catherine and Heathcliff’s presence. The narrative unfolds with the arrival of a tenant named Mr. Lockwood who comes to visit his landlord Mr. Heathcliff at Thrushcross Grange and reads the diary of the young Catherine Earnshaw, learning that she had an intimate childhood relationship with Heathcliff. His terrifying dream of the ghost of a young girl begging to enter his room leads to a severe ill treatment meted out to him by Heathcliff and his subsequent interaction with Ms. Nelly Dean, an old housekeeper closely related to both the Earnshaw and Linton families. Ms. Dean, then provides the secondary narrative embedded with Mr. Lockwood’s narrative and unfolds the plot bit by bit. While recalling the history of the Earnshaws, she takes over the narration and begins the story thirty years earlier when Heathcliff, a young gypsy boy is introduced to the Earnshaw family by the Late Mr. Earnshaw. The story then follows a long, winding path of resentment, childhood companionship, love, brutality, revenge and abusive relationships that affects the lives of almost all the characters encompassing three generations. The constant physical and emotional struggles and the continuing tension between the characters”Catherine and Edgar Linton (Catherine’s husband), Heathcliff and Hindley (Catherine’s brother), Heathcliff and Hareton (Hindley’s son), Heathcliff and Isabella (Linton’s sister) form the crux of a turbulent saga that end in the death of Heathcliff. The center of the book, however, is the story of the passion between Catherine and Heathcliff, which unfolds in four stages in a back-and-fourth narrative. While the first part tells about the close relationship between Catherine and Heathcliff and their common rebellion against Hindley at Wuthering Heights, the second part reveals Catherine’s betrayal towards Heathcliff, her marriage to Edgar Linton, and her subsequent death in childbirth. The third part covers the story of Heathcliff’s revenge and brutality at Thushcross Grange. The fourth part unfolds itself some years back and tells the readers about the changes that come over Heathcliff and finally, narrates his inevitable death. The Catherine-Heathcliff spiritual union remains the dominant theme even in the last two parts, long after the death of Catherine, underlying all other plot developments. As for the structural brilliance of Wuthering Heights, critics are plainly divided. Mark Schorer had described the novel as one of the most meticulously crafted and constructed literary works of all times. On the other hand, critics like Albert J. Guerard commented that in this splendid novel, there are structural imperfections as Emily loses control over the plot occasionally. Charlotte, her own sister had commented that Emily was an unconscious artist who ‘did not know what she had done’. Whether Wuthering Heights is Gothic or metaphysical in its essence and finer appeal remains yet another controversial issue among its critics. The strange, powerful world of Wuthering Heights inhabits shadowy, brutal yet enigmatic figures like Heathcliff and Catherine who are consumed by the utmost personal, peculiar world of their feelings. In their very essence, they represent a gothic world. Incorporating the Gothic elements of imprisonment, escape, flight, persecuted heroine, ghosts, as well as introducing the mysterious Heathcliff who destroys the lady he loves and who usurps inheritance; Emily Bronte establishes several Gothic traits that are embedded into the narrative of the novel. On the other hand, the overwhelming presence of a larger reality, the desperate striving for a greater, higher union and an unbridled passion in pursuing that quest suggest a transcendental meaning that is essentially metaphysical in its nature and final analysis. On the whole, the novel remains a potent, imaginative classic with a raw, rugged beauty and intensity to it that renders it timeless and universal. Author’s note: This poem is immensely personal, as I dedicate it to my precious little elder daughter Mithi who just turned 5 in November. It was written for her when I was 27 weeks pregnant, the tiny delight tucked inside my tummy. With this poem and with all my scattered thoughts about her, I had dreamed about sheltering her from this world of battered souls, daydreaming of some day, when after having her in my arms, I could fulfill both of our lives with the serenity and magic of love. O fabric of my dreams, my unborn child. And fade the vibrant color of your lips! Wake your dreamy, azure eyes with a psychotic stare. Where endless battles clash with crackling, forbidden sounds. I think of you, clutching my chest in hunger and surrender. I think of you, wafting with me into pleasing flights of fancy. Hand in hand, we both will sure make our way. Humming a tune of love’s little quiescence. I don’t know how these empty years have passed, in evanescence. Of my rainy day caresses with you. Screams and murmurs alive in a hazy sleep. I am bound up tight in ropes– surrendered to your flames. Old stairs, shady buildings in twilight haze. Whip me with a splash of colors. Silly old tears of a forlorn city…..
You knock me down each time with your quandaries. Crush my breath–as if the sky is torn off my life. Together and apart, you watch me blown to death. The frozen memories, the buried yesteryear sins. Bleed and ache, whisper and scream, within ME. Being an ardent lover of poetry, to be more specific, romantic poetry, I have always been fascinated with the sense of oneness I feel with the poets’ world. Romantic poetry, for some of its major attributes like pictorial quality, imagery, mysticism, absorption in the beauty and life of nature, classical features and above all, celebration of beauty and aestheticism—has a huge amount of appeal to the highly refined and sophisticated readers of all times. And surprisingly, it is this pictorial quality, sensuous delight in nature, sheer artistic beauty and richness of imagery unfolded by romantic poets that continue to inspire us in some way even after so many years! When we come to think of the Romantic poets, the name John Keats, the finest flower of the Romantic Movement-comes foremost on our minds. Deeply revered as one of the greatest word-painters in English poetry, his verses present subtle imagery and a fusion of different sensations that has time and again, produced musical effects, and in that, he was rather a conscious artist. Tracing his poetic growth, researchers have found out that he was educated almost exclusively by the English poets. While in the early part of his career, the influence of Edmund Spenser, specially his ‘Faerie Queene’, was instrumental in awakening his imaginative genius; the brooding love of sensuous beauty, the luxuriance of fancy and the response to the charm of nature characteristic of Spenser’s poems were to be re-echoed in Keats’ poems. In the later years, critics have cited the influence of Shakespeare, Milton, and even Wordsworth in his poems. While the influx of Shakespearean words, allusions find expression in the 1817 volume of his ‘Endymion’, he was also greatly influenced by the distinctive spirit and vocabulary of the old English poets, especially those of the Renaissance. Thus saying, it is worth mentioning that the influence of Milton’s ‘Paradise Lost’ is highly visible in his ‘Hyperion’. At the same breath, the classical influence on his poetry has also been a subject of intense research by scholars. “The same that oft-times hath/Charmed magic casements, opening on the foam/Of perilous seas, in faery lands forlorn”. “Forlorn! The very word is like a bell/To toll me back from thee to my sole self”…which is a perfect example of romantic passion fused with classical restraint. In all his mature Odes, including ‘Ode to a Nightingale’, Ode on a Grecian Urn’, ‘Ode to Melancholy’ and ‘Ode to Psyche’, he is said to have cast aside his over-loaded diction of his earlier poems and come out with a romantic richness that is replete with the Hellenic clarity characterizing Greek literature. While beauty and mutability are said to be the recurrent themes in Keats’ mature Odes, critics have pointed out that he was somewhat “obsessed by the close juxtaposition of joy and grief, delight and pain”. Some point out, that in his pursuit of beauty, he became an escapist, ignoring the realities of life. In his earlier poems, ‘Isabella’, ‘Lamia’, The Eve of St. Agnes’ and others, his imagination certainly plays with the romance of love, with medieval elements, cruel, mysterious ladies, ‘a faery’s child’, the spell and enchantment of the magical world. However, all this is characterized by his sense of alienation as a creative thinker, which, assume a deeper tone and meaning in his later works, i.e., his Odes. Throughout his journey as a poet, he strived to harmonize what scholars today say ‘the life of sensation with life of thought’. His earlier hankering for unreflecting enjoyment of sensuous delights, as seen in his ‘Sleep and Poetry’, is later replaced by a strong yearning to subject himself persistently and unflinchingly, to the joy and beauty of life, that is accompanied by the inevitable pain, hopelessness and despair of life. Hence, the lines: “Joy whose hand is ever at his lips/Bidding adieu”. Keats knew that joy and beauty on this earth is transient, and from this transience, the melancholy so very typical of his poems originate. Melancholy, he says, “dwells with beauty/Beauty that must die”. These lines can never come from the pen of an escapist. For me, he was purely a thinker profoundly concerned with the mystery of life which he deals as a poet, not as a political rebel or as a philosopher. Scholastic researches strive to bring out new perspectives of his poetry even today. As a reader, I would be content exploring the romantic fervor and richness of imagery of his poems for years to come! Author’s Note: For my daughters, the apples of my eyes, Srobona (Mithi) and Sharanya (Rimli), a small gift from Mamma on their birthday. Yet craving to embrace your sweet nothings…. Howl in your ears to grow up, let go. In the vain world where you may open your eyes tomorrow. If you are one of those who believe that there must be the presence of a subtle literary craft in presenting nonfiction, just as in fiction and poetry, you must admire and acknowledge the literary value of Creative nonfiction as a contemporary genre of literature. It is a fact that today a lot of writers are showing their passion in writing and publishing creative nonfiction. They are enjoying the excellence of their craft by exploring the pleasures of writing personal essays, autobiographical excerpts, memoirs, literary journalism. Gone are the days when only snooty novelists and short story writers, apart from poets, were considered the only species of serious writers. While the art of writing personal essays and autobiographies have been exploited by thousands of writers for many years now, memoir writing, another sub-genre of writing autobiography, has caught the fancy of a multitude of creative writers in the recent years. Any creative writer, who has the gift of storytelling, who has an engrossing life story to convey to his readers, who has the ability to craft that life story with resonance and presence, can come up with interesting, engaging memoirs. Some of these writers in the recent past have truly done so, with memoirs like Elizabeth Gilbert’s ‘Eat, Pray, Love’, Judith Moore’s ‘Fat Girl: A True Story’, or John Grogan’s ‘Marley and Me’ being dominant on bestsellers lists for quite some years now. In the past few decades, journalistic works based on true events and stories have enjoyed widespread popularity in the US and worldwide. In the same breath, one can speak about the growing popularity of creative nonfiction based on true stories and personal accounts written in a creative, fictional tone, while maintaining the realism in the writing. Memoir writing, a distinct genre of writing creative nonfiction, has gained the maximum popularity with people loving this form of narrative real life experience. A genre that derives its name from ‘memory’ or ‘reminiscence’, memoir writing takes the readers to a voyage where they get to experience a particular aspect, a particular perspective of the author. Often the journey is one of self-discovery, or the one that is therapeutic or cathartic in the final analysis. The cornerstone of success of a memoir writer is his/her craftsmanship with words, the brilliance of the syntax and the language structure. We are talking creative nonfiction here, a distinct variety of nonfiction where the theme may be based on a true story or event, but where the content and the presentation, the overall execution of the theme aims at not only informing, but also moving and pleasing the reader. This is why when the writer writes a memoir, he/she uses some subtle narrative techniques of an autobiography as well as some elements of the tone and style of fiction writing. Memoirs are almost always autobiographical in tone and context; though structurally, a memoir writer is not supposed to cover his entire chronological life span or the traditional arc of birth to childhood to old age. Like most autobiographies, a memoir writer gives an account of his/her life experiences in the first person narrative. However, the specialty of memoir writing is that through the engrossing autobiographical narrative, the writer takes the reader to a specific period of his journey of life, to a specific experience that engages the readers till the very end. ·Like any modern journalistic form of nonfiction, there is the use of the first person reportage in memoir writing. Due to this fact, memoirs are characterized by the restrained use of subjectivity, by the constant interpretation of what the writer observes as a life experience. There is a constant attempt at revealing the conscious and unconscious motivations and feelings of the author/narrator. · There is the development of a healthy emotional and intellectual curiosity that builds up while the writer narrates his life story. · What makes memoir writing a distinct piece of creative nonfiction is that through the journey of narrating his personal experiences, the author tries to reach out to a universal perspective. Finally, it is the intriguing combination of the rumination, the lyrical impression, and the sheer beauty of the language with which stray hard facts are woven into the texture of a memoir that makes it a delightful and moving form of literature of the contemporary times. As Annie Dillard, the diva of nonfiction prose says, it is the formation of the text, the creation of a piece of art that comprises the beauty of nonfiction prose, just like a painting or a musical composition.